Hi everyone! Brandy here from Nutmeg Nanny. Faith and I hope you are all enjoying this lovely holiday season. We are also super excited because it’s time to submit your Christmas recipes!!! As a reminder this recipe can be anything that says Christmas to you. Also please feel free to submit as many recipes as you want. All we ask in return is that you link any post you submit back to All Through the Year Cheer. You can submit your recipe by linking via the MckLinky (located at the bottom of the post) or by emailing us if that is easier. 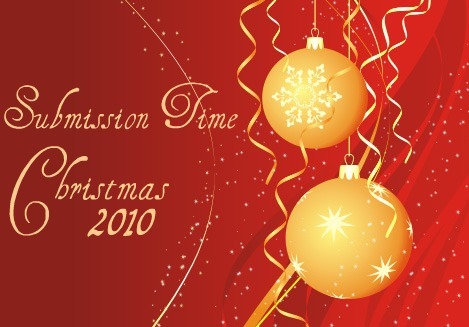 You have until Wednesday December 22nd 2010 at 9pm EST to submit your recipes. The recipe roundup and winner will be announced on December 23rd. The prize for our Christmas winner will be the The Great Christmas Cookie Swap Cookbook. Imagine all the delicious cookies you can make from that book…yum! Now onto this delicious and VERY simple Christmas candy. I have been making this little treat for years and is always a big hit on my cookie platter. I usually use normal chocolate Hershey Kisses or Hugs but this year I tried using their special addition Candy Cane Kisses. Amazing! I love it. It’s a delicious bite of mint, chocolate, and salty crunchy pretzel. If you are looking for a little something to squeeze on your tray you should definitely give these buttons a try. 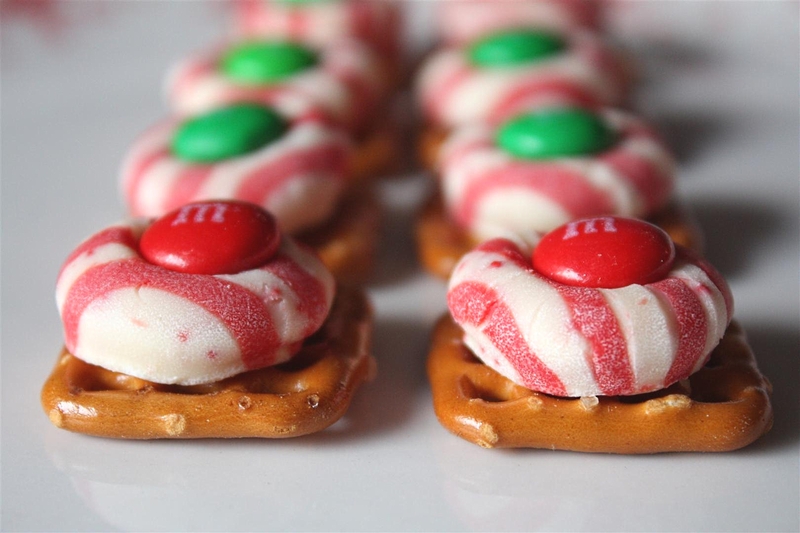 Lay pretzels out onto baking sheet and top with unwrapped Hershey Kiss. Put into oven for approximately 5 – 7 minutes. You want to soften the Kiss so the M&M will push smoothly into it but you do not want to melt the Kiss. 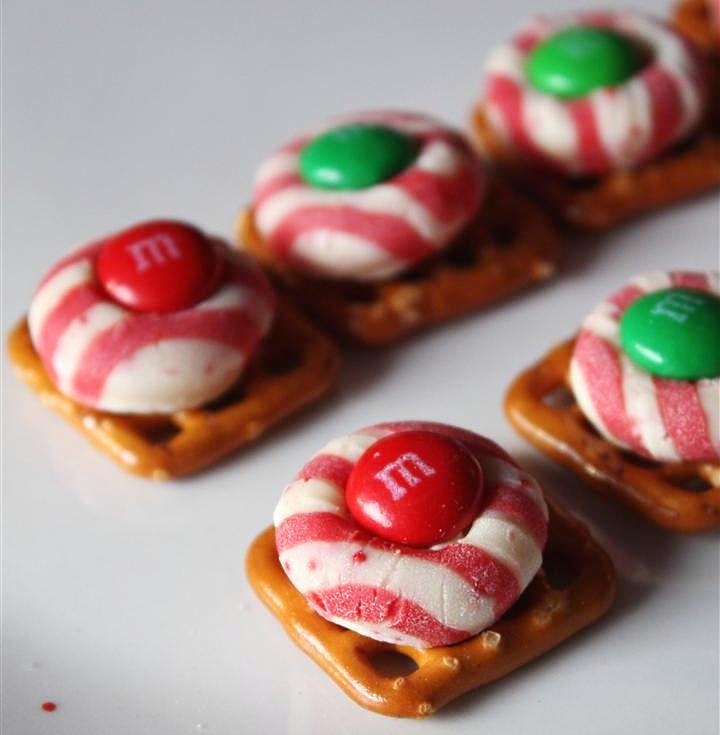 I’ve made these with regular kisses, but the candy cane version looks so fun, and I can imagine they taste great too! 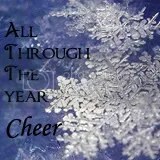 Thanks for co-hosting the “All Through the Year Cheer” party! These look awesome! I like it that it is so easy to make too. I will have to make some for our Christmas gathering. I did submit my post earlier through e-mail and have just entered using the linky. Thanks for hosting! I think they taste like Girl Scout thin mint cookies! (but better) Yummy!